We have received 9 reviews of Troublemakers . You can add a review or scroll down to read reviews. To send in your review of Troublemakers , please fill in the info below and click the button labelled Send Review Now. Reviews will be checked by our team before they appear on the website. Your last name will not appear on the site, but we need to know who you are in case you win a prize! 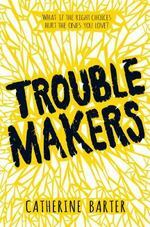 Troublemakers is Catherine Barter’s first novel. 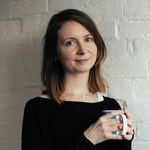 She lives in East London and co-manages a radical independent bookshop in King’s Cross. She worked for 10 years in Norwich in a library, bookshop and for an organisation campaigning for the rights of garment workers. Catherine always wanted to be a writer, but she also always wanted to be a librarian, bookseller, gymnast or singer amongst others! Fifteen-year-old Alena never really knew her political activist mother, who died when she was a baby. She has grown up with her older half-brother Danny and his boyfriend Nick in the east end of London. Now the area is threatened by a bomber who has been leaving explosive devices in supermarkets. It is only a matter of time before a bomb goes off. Against this increasingly fearful backdrop, Alena seeks to discover more about her past, while Danny takes a job working for a controversial politician. As her family life implodes, and the threat to Londoners mounts, Alena starts getting into trouble. Then she does something truly rebellious. Catherine has a PhD in American Literature. She likes scary movies, including The Shining, The Blair Witch Project, The Exorcist, Jaws and The Woman in Black. Her favourite authors at the moment include Judy Blume, David Almond, Patrick Ness, Margaret Atwood and Sherman Alexie. Be sure to read this book! KAITLYN gave Troublemakers 4 out of 5 and now plans to read All About Mia by Lisa Williamson. jason gave Troublemakers 3 out of 5 and now plans to read Noah Can't Even by Simon James Green. I found the storyline of the book and the characters great, I also found them very realistic. But I found the book so slow, this wasn't because I found it hard to read, it was because I found that it just didn't bring me in or interest me as much as I hoped it would. Hannah gave Troublemakers 3 out of 5 and now plans to read The Crash by Lisa Drakeford. i liked this book. it took a while to get into it but i really enjoyed it at the end. i found myself annoyed by how little lena thought about the effect her actions had on other people. qianye gave Troublemakers 3 out of 5 and now plans to read All About Mia by Lisa Williamson. I found Troublemakers difficult to persevere with due to its astonishingly slow beginning. Certainly, a book that dives straight into the storyline and values quantity over quality would, in most cases, be less entertaining than one with a build of suspense and a significant air of mystery, however this book only got started for me around 1/3 of the way through and often it ground to a halt again just after it had picked up some pace. I found myself battling irritation at the constant, repetitive arguments between Danny, Nick and Alena and saw no purpose in most of the supporting characters- some of which we never even meet and are more or less irrelevant to the story. There were certain characters that I did identify with, such as Nick, who was my favourite character by far, due to his fatherly and supportive manner along with his character development where most other characters had little to offer. In my experience, there were characters and events that didn't seem to serve a purpose, to the story or otherwise, such as the east-end bomber with whom this ordeal supposedly started, who ends up having little to no character development or background and who, for me, seemed more like a convenient prop than an engaging and relevant character. I usually enjoy political fiction, and this book did have it's interesting moments, but overall this book was, for me, an slow and uneventful read. Poppy gave Troublemakers 2 out of 5 and now plans to read All About Mia by Lisa Williamson. Despite this book including excellent description, I found it difficult to get intrigued into this book initially. River gave Troublemakers 3 out of 5 and now plans to read All About Mia by Lisa Williamson. I really like this book!! I would definitely recommend it. If I had to read it again I would not hesitate! Bethany gave Troublemakers 4 out of 5 and now plans to read Noah Can't Even by Simon James Green. I thought this book was ok. It had mystery surrounding Alena's mother's past and the East End bomber but was lacking story aside from that. I found it slow paced at times but thought Danny and Nick were interesting characters. Jem gave Troublemakers 3 out of 5 and now plans to read All About Mia by Lisa Williamson. I think the main characters, Alena and Danny were very interesting and developed, though I found it hard to relate to them for the majority of the time. The story is secretive at the start but opens out through the book however I found it dull at times. Emily gave Troublemakers 2 out of 5 and now plans to read Noah Can't Even by Simon James Green.